The Legal Content Curator: Bessie Margolin and the Working Woman | Blog | Ms. JD | Determined to Rise. The lenience of her whirling-place. And altogether she does Rather Well. Today, women fight their way to success both in the home and in the workplace. Marlene Trestman writes, in her 2016 biography of Bessie Margolin, about one such working woman, a fair labor lawyer, feminist, and Supreme Court advocate who lived from 1909 until 1996. Bessie was the young daughter of Harry and Rebecca Margolin, Russian-Jewish immigrants whose native language was Yiddish. She and her sister were admitted into the Jewish Orphans’ Home in New Orleans after their mother’s death, in 1913, because of their father’s financial situation. The girls attended the Isidore Newman Manual Training School two blocks away until their graduation. Fair Labor Lawyer provides small glimpses of Bessie's more personal views on work in a male-dominated field, too. Trestman writes of Margolin's explanation, in an article for her sorority's magazine in May of 1938, that a woman lawyer “must aim to become one of the men, without, however, becoming masculine and overly aggressive in her approach.” Bessie experienced many clandestine romances, but did not get married for the rest of her life, choosing instead to focus on - and dedicate her life to - her career. 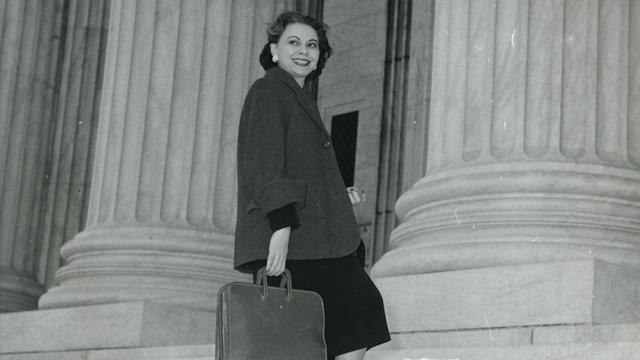 She eventually argued 27 cases before the Supreme Court, prevailing in more than 90% of them. Trestman’s book is a fascinating look at the life of Bessie Margolin, with unexpected insights into the more humorous experiences she faced as a working woman at the time. There is much we take for granted today, and a careful reading of history can show us what it has taken for women to be respected as intelligent and ambitious beings in their own right.